July is Palm Garden GEM Celebration Month. 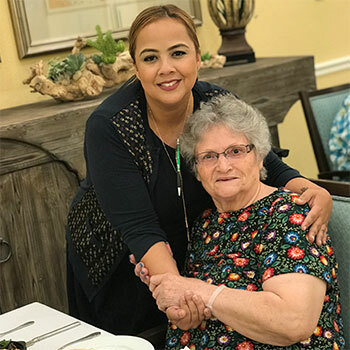 We think that knowing our guests, residents and families’ life story better informs how to care for them. See, we believe to truly care for people we must know them personally. We walk in their shoes; see what they see and feel what they feel. Kindness is not unique to skilled nursing. Good caregivers are drawn to our profession because they want to help people, make them feel special. What is unique to The Palm Garden Family is that we encourage Going the Extra Mile. We believe celebrating the life story is what makes us Unique. Different and Special. Making our GEM process part of service program is what makes Palm Garden Elite. I’d like to introduce you to a woman whose life story is unique, different and most decidedly special. I’d like you to meet Mrs. Prinzie. She is a Member for Life at Palm Garden of Gainesville. She was born in Europe in 1938. I was captivated when we spoke because she is so sharp. She’s a little difficult to understand because she has a thick accent. It sounds like French but it’s not. I asked her about it. She said she thinks her accent is French but it makes no sense because the only French person in her life was her father. He died in 1940 when she was just 2 years old. Could you imagine losing your dad at the age of 2? I lost my Pops only a few months ago and I am still devastated. She and her husband came to the United States in the sixties. He was in the military. In fact, he helped our boys get ready for Vietnam as a translator. They raised two boys. One of them passed and she doesn’t talk about it much. The other lives in California but she has no contact with him. See, he disowned her because of her religion. Mrs. Prinzie believes in one savior, he another. She’ll tell you she still loves him with all her heart in spite of his intolerance. That’s Mrs. Prinzie and our very own team member, Charolyn Hicks. Charolyn was drawn to healthcare because she likes helping people. She started by doing Medicaid applications in New York. Moved to Florida, fell in love with helping people at Palm Garden, and became a licensed administrator. They’ve established a lasting bond. See, Charolyn took the time to know Mrs. Prinzie. She knew she had a birthday while she was in the hospital and no one noticed. Everyone deserves a birthday celebration. So Charolyn arranged a beautiful birthday dinner once Mrs. Prinzie came home to Palm Garden. She picked up Red Lobster and they dined together in our fine dining center. Mrs. Prinzie calls Charolyn her daughter. “That’s my baby,” she says with a hug, kiss and a big smile. Now compare that to Mrs. Prinzie’s experience at the hospital and realize the impact you make every day. Big or small, GEMS are best when they relate to the life story. I’m convinced whether we had a program or not, Charolyn would have done this for Mrs. Prinzie. It’s what we do. It’s who we are. We are Palm Garden.